How to choose and buy cookware set for your home is not easy. The number of cookware brands seems to be growing every day and the range of pots and pans is enormous with materials varying from stainless steel, cast iron, aluminum and copper. Confusing the issue even more is the clad style cookware range which is cookware made up of two or more different metals. So with all this in mind how do you eventually decide on the right type of cookware whilst keeping within your budget? The answer is to know exactly what you want before you buy. In a nutshell this means that you need to know enough about cookware to enable you to make an informed decision. What should you look for when buying cookware? Heat conductivity – Some metals are better heat conductors than others. For instance, copper is a particularly good heat conductor whereas stainless steel is not. What this means in terms of cookware is that the better the heat conductivity the better and the more evenly your food will cook. It also means that when you turn the heat up or down the copper cookware will react a lot quicker to the temperature change than stainless steel cookware. Price – The amount you pay for your cookware will most likely be a determining factor in what you end up buying. The rule of thumb with cookware is to buy the best you can afford. Durability– Some types of cookware will maintain their good looks and last longer than others. Stainless steel is considered to be one of the best in this respect. Reactivity– Some metals react with certain foods. Aluminum for instance has a tendency to react with tomato and other acidic dishes. This means that your food can actually absorb some of the metal, so take care with your cookware choices and ensure that you are aware of the reactivity of each product. 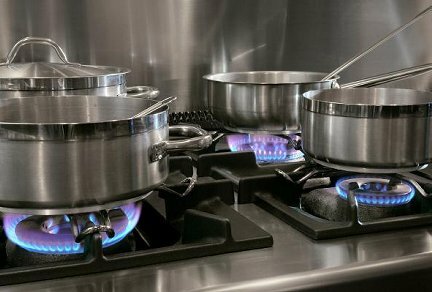 Maintenance– If you would prefer to not to have to shine your cookware every night just to keep it looking good then you will need to consider the amount of maintenance required to keep it in tip-top shape. Copper and cast iron cookware generally require quite a bit of work to keep it looking pristine whilst stainless steel is normally a little easier to look after. Stainless steel would have to be the most common type of cookware materials. You will probably find it in most households. Stainless steel is actually an alloy of metals including steel, carbon and chromium. The reason stainless steel is called ‘stainless’ is because of its ability to resist corrosion. Stainless steel is an excellent choice for cookware BUT because of its inability to conduct heat well it is important that you choose stainless steel cookware that has an aluminum or copper core. Without it you will find that you will get hot spots on the cooking surface and foods will cook unevenly. Not a good conductor of heat. Cast iron is a material that has been used to create cookware for hundreds of years. Those that use cast iron cookware absolutely swear by it for its exceptional cooking ability. Nevertheless, cast iron cookware is not an easy to maintain product. It requires a little effort to keep it working the way it should. It is extremely durable and it is not uncommon to find cast iron cookware that has been passed down through the generations. Check out Linda Stradley’s article onCast-Iron Pots & Pans. To purchase cast-iron pots and pans, check out What’s Cooking America’s Cast-Iron Pots and Pans Store. Aluminum is used in approximately 50% of all cookware manufactured today because of its excellent heat conduction. Aluminum is a soft metal and can scratch and dent easily. It can also react with certain foods which is why it is generally sandwiched between other metals. You will often find stainless steel cookware with a layer of aluminum offering the benefits of both materials. Aluminum is also often treated through a process known as anodization. This process places a layer of aluminum oxide onto the surface making it scratch resistant as well as ensuring that it doesn’t react with foods. Aluminum cookware is often finished with a nonstick coating to ensure food remains unburned. Copper cookware is commonly used amongst professional chefs because of its excellent heat conduction. Copper cookware on its own is generally quite expensive so it is not often seen in many home kitchens. Copper is also often found sandwiched between layers of other materials like stainless steel. Copper cookware is the cookware of chefs and for good reason. It conducts heat extremely well which means it heats quickly and adjusts to changes in temperature just as quickly. This allows greater control over your cooking. Think about what pieces of cookware you need before setting out to the shops. There is no point in buying a 20 piece set if you will only end up using a few pieces. Buying a cookware set is usually a lot cheaper than buying piece by piece. But again if you are not going to use all the pieces then really consider if a set is worth the money. Buy the best you can buy for your money. Making the final decision on whether you want stainless steel, cast iron, copper or aluminium is really a personal decision based on how much time you spend cooking, your expertise in the kitchen and your budget. For all round flexibility, usability, and price, stainless steel cookware would be at the top of the list. When you consider the advantages it beats the others hands down. However it does have one big drawback in that it doesn’t conduct heat well and if you are concerned about having evenly cooked foods then heat conduction is important. The solution to this is clad cookware. This style of cookware is made up of multiple layers of different metals. So, when shopping, look for stainless steel cookware with a layer of copper or aluminium sandwiched in the base. Stainless steel cookware with a copper base is generally more expensive than cookware with an aluminium base, but it does have the advantage of better heat conduction. Take your time when choosing cookware, buy the best product you can afford, and follow the manufacturers instructions on looking after your pots and pans and you will be rewarded with years of good service and an enjoyable cooking experience. I had no idea that copper is a better heat conductor than stainless steel. I can see why this would be important for people who cook a lot and want to find the best thing to cook their food in. My sister just got married and received a variety of different pots and pans. I’ll have to talk to her about keeping these tips in mind. Hi, this article really helpful for me. I am confused for choosing the best cookware set what would be the best for everything. But review this article my confusion is clear, Thanks. Really very helpful article! I am interested in purchasing a stainless steel cookware set. This review cleared my confusions! Thanks! Very informative article. Thanks for sharing. Till now we choose all the cookware by looking at its shape and price. But now it will be a fun to buy cookware with all these info in mind. Thanks. Which cookware material would be best for a beginner to start with? It’s good to know more about cookware. It’s hard to decide which material to choose for my kitchen, but this clears a lot up. Stainless steel seems like a good idea because it’s inexpensive and durable! I always prefer cast iron and stainless steel cookware. They are durable, cost effective, easy to maintain and make food delicious. I have an electric stove with a flat, glass top. I cook for my family but it’s not something I love to do. I currently have stainless steel cookware with copper bottoms. However, all of my pots have formed a protuberance in the center of each bottom, which causes the pot to wobble. This makes it impossible to cook food evenly. I just want a good set of pots that work well when I use them. What should I get?